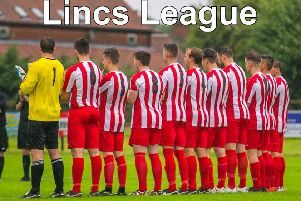 Mason Bros Lincs Junior Cup, round one (KO 2pm): Park Utd v Tetney Rovers (N. Anderson), Barnetby Utd v Swineshead Institute (R. Hall), Old Dons v Scotter Utd (A. Murray), Limestone Rangers v Pointon (D. Birkett), Appleby Frodingham v Old Leake (E. Nundy), Nettleham v Boston College (M. Thomson), Ruskington Rovers v Fulbeck Utd (P. Keeble), Long Sutton Athletic v Spilsby Town (C. Hardy), Holbeach Bank v AFC Holton Le Clay (P. Haines), Billinghay Athletic v Coningsby (A. Jackson). Workforce Unlimited Premier Division (KO 2.30pm): Kirton Town v Railway Athletic (N. Sleaford), Wyberton Res v Skegness Town Res (R. Dungworth). Workforce Unlimited Division One: FC Hammers v Horncastle Town Res (S. Beaumont), Fosdyke v Friskney (N. Christian), Freiston v Fishtoft (R. Crozier), Woodhall Spa Utd v Pointon Res (N. Saunders). Workforce Unlimited Division Two: Boston Athletic v Railway Res (M. Grant), Boston International v FC Wrangle (M. Winwright), Colsterworth SSC v JFC Seniors (D. Lovell), Coningsby Res v Caythorpe (R. Mather), Skegness Town A v Eagle Utd (L. Crawford), Spalding Harriers v Holbeach Bank (M. Brader). Workforce Unlimited Division Three: Benington Res v College Res (D. Bent), Mareham Utd v Fosdyke Res (J. Harmer), Woodhall Res v Digby (L. Mitchell), Wyberton A v Old Dons Res (J. Francis).